Hu Yuan (pictured here) has been running one of the few refuges in the city for abandoned pets. 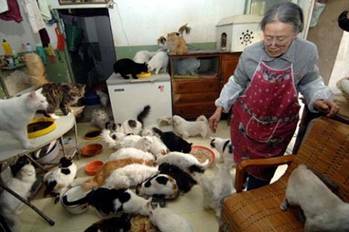 She has taken in 70 cats over the past year and is caring for 250 abandoned cats. Yuan said that if she doesn’t take them in, the cats will surely die. She added that cats are dumped on her doorstep frequently. The round-up has been particularly intense in areas around Olympic venues and in streets and alleys surrounding five-star hotels where guests will stay during the summer games. Animal welfare groups estimate that tens of thousands of cats have been collected in the past few months. Get more publicity!!!!! Screw China than!!!! if enough people are aware of this.. they may not want to go to China for the OLYMPICS!!!! Animals deserve more respect… why dont we punish people in jail more instead of catering to them???? Animals dont even commit crimes.. they are at our mercy!!!! This is just plain disgusting and i cant believe that so many people dont have any heart or consience!!!! may they go through the same torture when they go to hell! HOW DISGUSTING!! How about doing that to DOGS & PEOPLE? Get this information out to the national media, which is now reporting on other problems related to the Olympics being venued in Beijing. I agree – get the word out! Tell people to boycott the Olympics and show them we will not tolerate such practices. It’s the only way to get people to stop doing these kinds of things; when it hits them in the pocketbook or politically. You can’t plead that their actions are inhumane – they don’t care. I agree with Chris 3/14. The word needs to get out to the public by every means possible so that everyone will know what is going on and then people may boycott the Olympics. This may be the only way that a voice for the animals will be heard but other countries should know also so they may boycott also. Animals and people should never be treated in such a way but we cannot control the world as long as we are still in satans system of things. Thank goodness we are living in the end of the last days and armegeddon will soon be here and we and the animals will not have to suffer from mans cruelty. Finally, at last the world will be aware of what’s going on. I found out about cat and dog eating 3 years ago but this has been going on for many years. Don’t be afraid to expose it all for what it is!